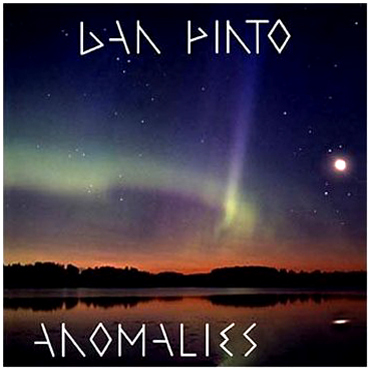 Dan Pinto's BRAND NEW CD, "ANOMALIES" has ARRIVED!! copy right from this site! It's a good one! After 13 years , Dan has come back to his roots and released a Jazz-Rock Fusion mix of some of the most eclectic music that you'll ever hear. And with this new release, he brings a few very versatile and talented players to accompany him on several tracks. His guests include "Ivan Romero," an incredibly versatile and very talented guitarist, "Rhonda Schuster," a multi-award winning singer/songwriter and "John Asti," a seasoned pro veteran reeds player. Details about his musical guests can be found on the Anomalies Guest Page . The new CD features TEN tracks, three of which were derived from works that Dan Pinto wrote many years ago but never officially released. The other six tracks are brand spankin new! The level of music and talent on this new CD is only matched by it's concept theme and package design for which many months of work were invested. The cover, title, art design, illustrations and concept all center around the general theme of various Anomalies. Anomalies are best defined as being a deviation from the common type or rule. Someone or something abnormal, unusual or irregular. And as you will hear and see, there is nothing regular about any part of this new CD. To find out more about Dan Pinto's latest release, click over to the Anomalies Main Page. September, 2011... Eclectic Sound & Dan Pinto would like to wish you all a "Happy Halloween!" In celebration, we are posting for the first time, a FULL MP3 recording of Dan's "The Haunting" from his "Ivory Towers" CD. This is also part of our promotion for Dan's re-release for this album coming in the near future. But those of you who remember, this was the piece that earned him a nomination for "Best Instrumental Song Of The Year" in the 2006 "Just Plain Folks Music Awards." A very cool and sort of eerie piece, you can check it out from start to finish in it's entirety beginning September 18, 2011 at the following link..."Ivory Towers - The Haunting." This full length version will run through October 31st! If you like what you hear then please pick up a copy of Dan's "Ivory Towers" CD to hear this and several other great New Age works by Dan Pinto! July, 2010... Eclectic Sound will be re-releasing Dan Pinto's "Ivory Towers" album. The new release will be a re-mastered work and include new music arrangements, much improved quality and a new album cover design, which by the way is being promoted now. Dan felt the music from this album captured a nice taste of work from his New Age category of music. Having won a nomination for "Best Instrumental Music Of The Year" in 2006, critics agree. The re-release is expected sometime next year so we'll keep you posted. February, 2010... Dan Pinto is Randy Allar's guest for some conversation about his music and latest CD release. Randy's "Fusion Show" on WCSB 89.3 in Cleveland has been promoting Fusion music for well over 20 years! Past guests include Frank Zappa, Joe Satriani, John McLaughlin, Steve Vai and Toto. To read a brief clip from the interview, check out the "Reviews/Interviews Page." January, 2010... Exciting news!!! Pinto Studios has nearly completed the construction of it's brand new on line movie theater!! And admittance is FREE! This is going to be VERY cool! We're still quite a ways off from the grand opening as a ton of work has yet to be done to prepare what will be exclusive never before seen video footage of Dan live in concert as well as studio recordings never posted before anywhere else on the web! We thought we'd let you know what's been happening, so keep checking back here for the latest updates! December, 2009... In light of the Christmas season, Dan Pinto and Pinto Studios are now inviting you to post photos of your dog! Just visit the "Christmas Music Page", scroll to the bottom and submit a pic of your dog or puppy. We'll post it and make your dog famous!! And while you're there, check out all the photos of other people's pups! And of course don't forget to listen to the music samples and feel free to get a copy of Dan Pinto's Christmas CDs! August, 2009... You can now look up Dan Pinto on the web at , The Free Encyclopedia. June, 2009... Dan Pinto is now on . More MP3s are available to listen to so go and check it out! March, 2009... Brand new page added to the Dan Pinto Official website, "REVIEWS & INTERVIEWS." Here you can track the latest that's being said about Dan Pinto. Read excerpts from the latest articles and interviews or click through directly to their source. February, 2009... Dan sits down one on one with Simon Barrett for a LIVE interview on Blog Talk Radio for "The Week In Reviews." Simon asks Dan about everything from the background of the new music from "Anomalies" to his interest in film soundtrack composing. In addition you'll hear some personal tidbits and tech talk. "Labyrinth" and "Bermuda Triangle" are two featured tracks. Read a transcript from the interview HERE or visit "The Week In Reviews" to listen to the interview in it's entirety. January, 2009... Dan has plans on releasing an acoustic CD in the near future. Strictly piano with no other accompaniment, the release date for this new album is uncertain as of yet but Dan says that this is something that he has always wanted to do. It will yet again redefine what he is capable of. JPF Music Awards. His title "The Haunting" from his "Ivory Towers" album was chosen through a process that selected less than one half of one percent during a judging term that took 13 months! In all, over 300,000 entries were reviewed from all around the World. Dan stays active working closely with independant film-makers scoring music for movie projects whenever possible. He also takes part from time to time in educating younger artists that seek to gain knowledge in that area. In recent past he worked with long time famed jazz musician/songwriter "Horace Ott", composer of "Don't let me be misunderstood," taking part in a presentation for the New Jersey Movie Makers Network on scoring music for movies at the MEMFEST FILM FESTIVAL in New Jersey. Exciting things are planned in the near future for the website. New video editing equipment is expected at Pinto Studios in the near future. A series of webpages showcasing Dan's music with video will become available which will include both live and recorded works as well as works for TV & film. Dan will be eventually working on digitally re-editing and mastering his film project "Die For A Life." Plans to showcase the film itself are in the works, however not for quite some time. Stay tuned for updates as they become available. Dan Pinto's previous music CD release was "Visions." This CD shows well of his music composition in contrast with something here for everyone. Track 1: "Surreal Symphony" is a work of something you would hear from a motion picture. Full orchestral arrangements make this piece the most powerful music on the CD. Track 2: "Visions" has a melody that tends to stick in one's memory. Ballad oriented, this was chosen as the title track because of it being the one piece of music that defines the CD as stiring the imagination. Track 3: "Counterclockwise" has an opening that's a bit deceiving. Beginning with a slow woodwinded orchestral sound and ultimately turning into a high energy piece run by syncopated rhythms and stylish synthesizer. Track 4: "For My Love" was written originally for piano and adds soft strings and woodwinds for what is one of the most beautiful melodies Dan has ever written inspired by someone very close to his heart. Track 5: "Neverending Goodbye" is a re-edited version of the song that was used as the closing number for the film "Die For A Life." It's tendencies are towards ballad music leaving the door open for lyrics. Track 6: "Seconds" is a piece you might expect to hear on a TV series program. Possibly a soapy type of drama. It is the one unique piece to the selection of music on this CD. Track 7: "Serenity" has a melancholy melody but it's chorus has a hopeful positive feeling. A song showing light and dark contrasts. Track 8: "Tajmahal" is a composition that was originally written back in the late 1980's but has set a benchmark for Dan's style of writing that he has quite often applied to his music ever since. This was a special selection for Dan that he felt deserved new recognition. by clicking over to the CD ORDERING PAGE. For more on Dan Pinto visit the HOME PAGE.